We have years of experience with bridal and formal wear. If you need your gown made smaller or possibly larger, shortened, cups added, straps adjusted or something more involved to be changed, we have had experience with it all. We have hundreds of satisfied customers who return to us whenever their life gives them another dressy occasion. We work on not only bridesmaids and prom dresses, we also specialize in the more difficult bridal gowns. We have not found a formal wear need or problem we have not been able to address or remedy. This bear can be made out of any one item. Maybe it's grandpa's old bathrobe or grandma's picture sweatshirts she always wore. It can be as simple as the curtains you remember from your Mom's kitchen. Yes, we've used those too! The key is that it can only be one fabric. If you remember it and are holding on to the fabric, we can make you a bear from it! We try to use as many details as are available on each garment, including graphics or embroidery already on the item. Nearly any garment or single type of fabric will work for this bear. Multi fabric bears are perfect for families who just can't decide on one favorite garment, or everyone wants the same one! We take everything you bring us and mix them all up! We have used multiple kinds of garments, wind breakers mixed with corduroy and sweaters or just a whole pile of button down shirts. Sometimes we get an entire laundry basket full. We can also use assortments of what you have and coordinate sets of bears that have a color theme. That way everyone gets a sample memory of many special pieces of their history. We've never met a shirt bear we didn't like! Whether it's flannel or dressy, a polo shirt or a blouse, shirt bears are made of one favorite shirt and usually include the collar and cuffs from the shirt if it has them as well as one or more of the pockets! If your favorite is a polo shirt, the placket and collar is used. Plaids or stripes, solids or prints, We just love em all! You can rely on this bear to be a crowd pleaser every time! 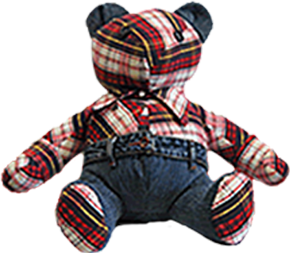 Jeans bears are a very popular choice and most often are a combination of a favorite shirt and a pair of jeans. Other style pants can be used as well. These seem to be a favorite memory of Grandpa or Dad but we've used many women's garments as well. One of our favorites was from Grandma's special Legion marching uniform. She was so proud of it!I can just see Grandpa now, coming across the yard with his chore pail in his jeans and flannel shirt? What a great memory! Almost everyone saves wedding dresses, but later, never has an opportunity to use it or even admire it after their wedding. It often gets saved in a box, never to be seen again! Many people fear the fragility of their gowns from generations past, but we can work past these spots and get a very beautiful bear or two. We use as many details as we can fit on the bear, including skirts, lace edging, buttons and veils. Most wedding gowns have enough fabric for at least two bears. We have also created baptism garments and ring bearer pillows from these gowns. Keep the loving memories of your special family days out in the open where you can enjoy them...possibly displayed near a wedding photo! So you still don't see an example of what you're looking for? Maybe you have some other fabric you'd really like made into your bear. Chances are we've done those too. Maybe a vintage fur coat? How about that leather jacket he was wearing when you first met him? An old army uniform? Your old sports jersey or the one from your favorite player? I know, your tattered baby blankie!! How about that old quilt Grandma gave you as a child? Well here's what you were looking for! We have made bears from all these memorable fabrics. © 2008-2019 Pins and Needles Alterations. Website by: Q InfoTek.